When I was a little girl, I remember my parents treating me and my sister to honey sticks on occasion—when we were out shopping at a local store, farmer’s market, or fair. These straws full of honey were pure delight to drink. I can almost taste the oh-so-sweet goodness now when I close my eyes and think back on those precious memories. When the Prophet Ezekiel said, It was as sweet as honey in my mouth, he was not talking about enjoying a delectable honey stick. Oh no, my sisters. He was talking about eating a scroll. Hold up. What? A scroll which read “lamentation and wailing and woe” was sweet as honey? Yes. And why? Because Ezekiel was obedient to God. He was obedient even when it probably did not make much sense to him. It may have even seemed crazy. Yet he did what the Lord asked of him, and his reward was sweet. Is God calling you to greater obedience to Him? Maybe you are struggling in the vocation where God has called you. Maybe there is a Church teaching that you grapple with understanding. This is a reminder for me, and for each of us, that God calls us to be totally obedient to Him and His ways. If you’re anything like me, that can be hard sometimes! How can we do that? Whoever becomes humble like this child is the greatest in the Kingdom of heaven, it says in today’s Gospel reading from Matthew. Humility. It takes humility to obey the Lord’s laws and to walk in His way—to rid ourselves of pride and to follow Him. My prayer is that we might be more like the Psalmist who gasp[s] with open mouth, in my yearning for your commands. Close your eyes for a moment, sister, and try to visualize this. Picture yourself as the Psalmist, mouth gaping wide open for God and gasping for His commands. Would that our desire for God might be so strong to move us to this place! Let us sing together: “How sweet to my taste is your promise!” Even when it’s difficult. Especially when it’s difficult. 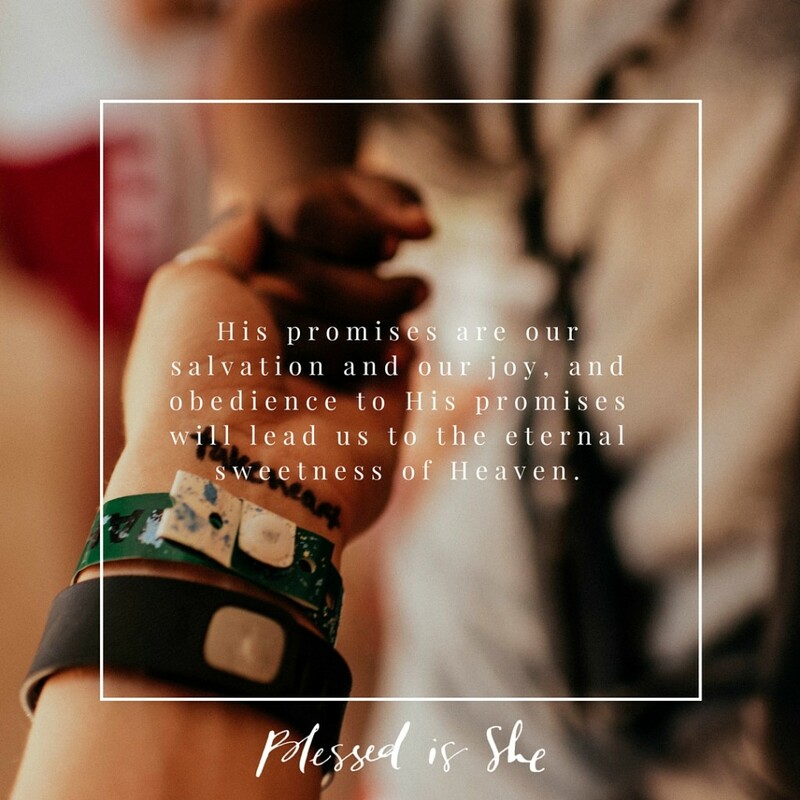 For His promises are our salvation and our joy, and obedience to His promises will lead us to the eternal sweetness of Heaven. Obedience to His promises will lead us to the eternal sweetness of Heaven. May the way we live our lives reflect the sweetness of God’s promise in our hearts. May others be drawn to Him, like bees to honey.